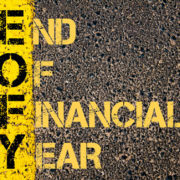 It’s that time of year again and the End of Financial Year is upon us. Before 30 June take a moment to review your business so you can start the new financial year off on the right track. increasing expectations and technology advancements, consider any improvements you made and if this has now changed your goals. Do a financial health check to consider your current cash flow, profitability and return on investment. If possible see if there are benchmark figures for your industry available and compare your business performance to these. Often, businesses forget to look at their systems and processes. Whilst it can be a tedious task to review and implement a new way of doing things, the long-term benefits of implementing something that will save you time, is a business win. The aim of this exercise is to identify any weaknesses you find and to develop a plan to address them. You don’t need to do all the work yourself either, get your staff to help out and come up with ways to improve the business. Actions out of this process should be documented, assigned to an owner and have clear timeframes agreed for resolution. Understand your industry, its unique qualities and opportunities. Understand your customer, who you are going to serve and how you are going to do it. You can’t be everything to everyone. Ensure that you have, or have access to, sufficient resources to achieve your objectives. Regularly monitor your actual results and identify the reasons for variations. Many businesses discover that even though their business is profitable, cash flow problems can be its downfall by stopping expansion plans or not having money available at the right time to increase staff or product lines. Ensure you understand any seasonal fluctuations in your business and also ensure you have a good invoicing system. Most accounting packages can send out automated reminders to customers who are slow to pay or perhaps it may be necessary to allocate a little more energy to chase up older debtors. Is it achieving your objectives? Measure the success of each campaign or activity to determine its effectiveness. Increase focus on products with a high margin and reward your employees for achieving targets in your preferred areas. The reward must be easy to understand and easily measured, monitored and communicated during the financial year. Major damage at your own, a key supplier or key customers premises. This could have a disastrous effect on your business. Loss of a key supplier. Failure of a key customer. Loss or illness of key staff members. Damage to your reputation through a social media attack. Take some time to think about your options, if any of these, or similar events occurred. opportunities, minimise risk, maximise profits and help you sleep better at night.